Raooorrrrrrrr….. This month’s “Spruce up your Space” theme “animal prints” has dropped us deep into mystical jungles and desertes savannahs. With an almost 70ies like plushiness we find accessories right out of Daktari or a James Bond movie. All transfer items at 50L, all copy items at 150L only through the weekend! Get them at our mainstore in Maquapit! Spruce Up Your Space with GREENE concept! GREENE concept is pleased to participate in the multi-designer Spruce Up Your Space event, beginning this weekend and running through Saturday, April 3. The theme this month is “Straight Out Of the Trailer Extravaganza!”, and this set actually does get you out of the trailer in a way that is familiar to trailer dwellers and campers everywhere – the classic green awning, lawn chairs, and artificial turf ground cover. We’ve given you two comfy outdoor sofas with sit animations to decorate your space – but there’s plenty of room to add your own personal touches to make your trailer a home. Pick up your set at the discounted price of 99L$ now thru April 3, only at the new GREENE concept store at Maquapit. Ivanova, GC and I are very, very busy preparing our new shop and new items for the relaunch we plan for April. We will have some exciting things coming up, and we will participate at the Home & Garden Expo again as well as being a designer for the Spruce Up events. So look out for some newness. 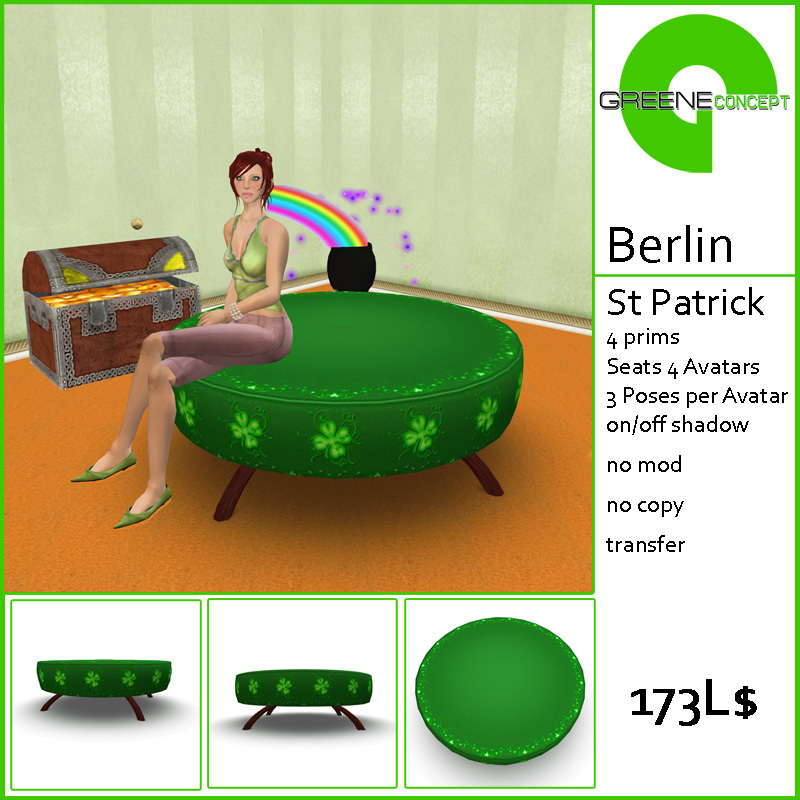 In the meantime, in honor of the National Saint of the Irish (Ivanova has some Irish blood, and yours truly is a huge fan of everything Celtic) I would like to bring our all time popular item – the 4-seater Berlin cushionsofachairseat in this wonderful St. Paddy inspired design to your attention again. Available in our Beachwood location as well as on XStreet SL for 173 L$ (as in 17.3. – the date of St. Patrick). Hello everybody who faithfully still has this blog in their readers. 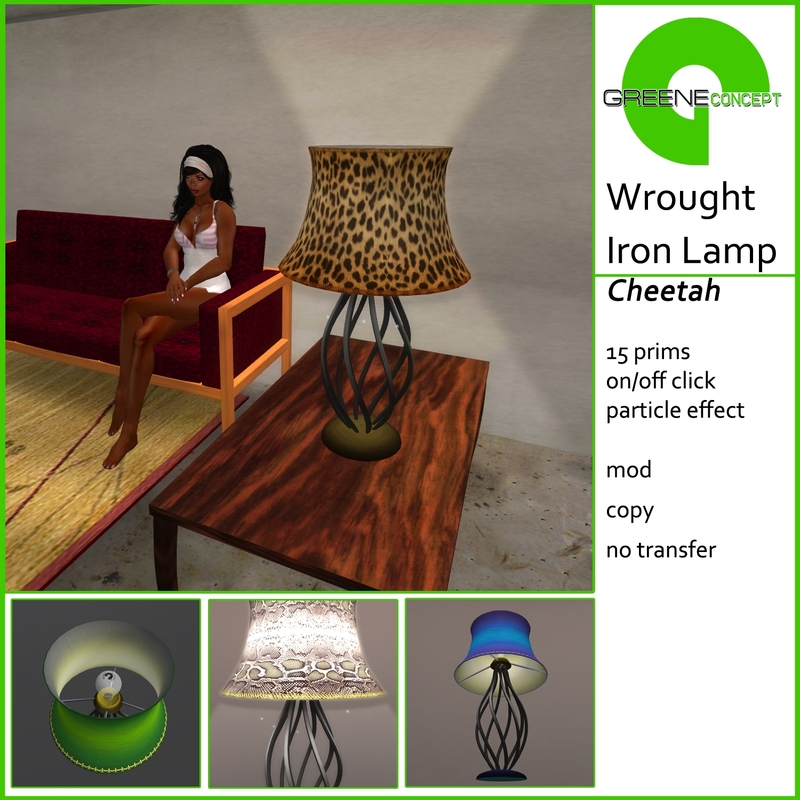 GREENE concept is not dead yet. Admittedly you have not heard a lot from us lately. It’s that pesky RL that often gets between things. However we have lots of goodness coming up and we are planning a relaunch in March, right for our 2 year anniversary. Right now we are working on our new mainshop on the nice mainland spot we bought. But there is more to come. Right now we’re also investigating the participation in some special events and promotions. So, stay tuned, we ain’t dead yet! Even though we officially founded GREENE concept in March, we spent the first three months developing only. We officially launched our brand towards end June 2008 – so by now we are 1 year old. There will be some new releases coming down shortly – for now we have marked down many products in our mainshop to 99, 149, 199, 399 and 599 L$. Come and visit our shop in Beachwood and check out the promotions! To the left is the new Emphasis bench, styled along the lines of the Emphasis chairs, and equipped with a color change menu. It seats 3 avatars. On the right is the Twisty bench for two people. The Bubble Chair is based on a design by my friend Gina Glimmer and was lingering in our workshop for ages. We finally finalized it and but a nifty particle effect in it. The textures on the bubbles are animated, as well as the sitting pose. While the Emphasis chairs are not new, the associated coffee table is. It looks especially beautiful with the silver Emphasis chairs, which is why we packaged it into a set for 200 L$ (basically buy 4, get one for free). 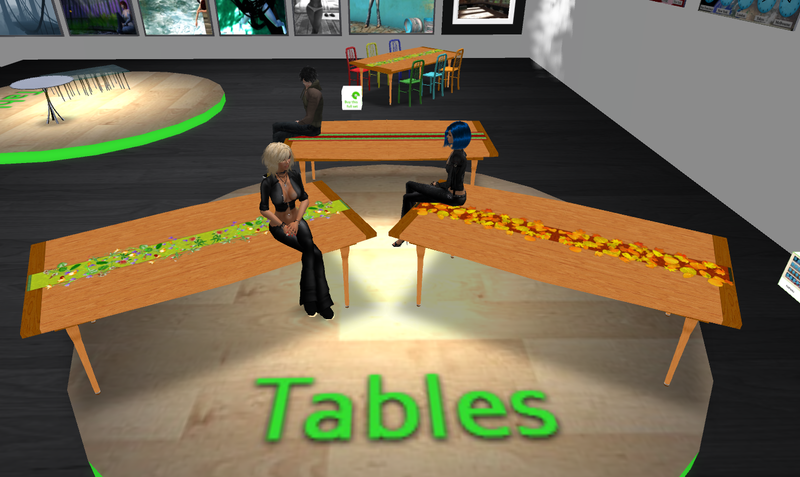 The new dining tables were blogged already yesterday, but Zeeva and Angela looked so cute sitting on them (sitting poses included) so I post them again. All items are available on the Home, Garden and Patio Expo (SLURL). Among the new items we show at the Home, Garden and Patio Expo are three dining tables, consisting of a balanced mix of regular prims and sculpted prims aimed at fast loading and good Level of Detail (LOD) rezzing. The tables feature a Spring, Autumn or Holiday runner and have two sitting-on-table poses built in. Right now they are exclsuively available at the Expo. Versions with different permissions will be available in our shops next week.